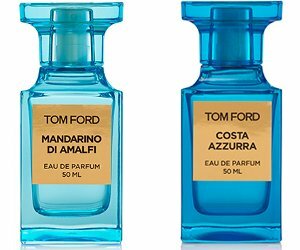 Tom Ford will launch Mandarino di Amalfi and Costa Azzurra, two new unisex fragrances joining Neroli Portofino in the Private Blend collection. Mandarino di Amalfi ~ a fresh herbal citrus fragrance with tarragon, spearmint and lemon. Update: additional notes include blackcurrant, bergamot, grapefruit, basil, black pepper, coriander, orange flower, clary sage, jasmine, shiso leaf, vetiver, amber, labdanum, musk and civet. Costa Azzurra ~ a fresh woody fragrance with oak, driftwood, lavender and vanilla. Update: additional notes include fucus (seaweed), agarwood, ambrette seed, celery seed, cardamom, armoise, juniper berry, myrtle, basil, lemon, yellow mandarin, lentisque, olibanum, incense and vetiver. Tom Ford Mandarino di Amalfi and Costa Azzurra will be available in 50, 100 and 250 ml Eau de Parfum. So, the acqua colored are the fresh ones? Like Aqua di Parma and their mediterranean line? Yep! I think Neroli Portofino has been a huge seller, I expect we’ll see more of these. I believe so, but I consider Azure Lime fresh, but the bottle is brown… Likewise, earlier generations of Neroli Portofino were in brown bottles as well…….. This is quite funny because after quite a while of consideration, I have just decided to get my hands on a bottle of Neroli Portofino. Now it seems like I will postpone the purchase again Need to smell Costa Azzurra! Yes…might as well test them all! Not sure when they’ll be in store, but I’m guessing June. I really did like Neroli Portofino. So, I will have to see if I fall hard for these too as well. Santal Blush is my absolute favorite Tom Ford fragrance. Love, love, love Tom Ford! Ok, I’m in love with the colors this time around. Seriously. Lucky for me, $ wise, I haven’t fallen for any of the Private Blends. That could be because I’ve only smelled like 4 of them. Haha. I remember smelling Noir de Noir when they 1st came out, and I still think about it. That’s surely a sign to revisit it. I must soon, cuz it’s been haunting me for years. Haha. I blotter-sampled these two at Sniffapalooza. They’re certainly worth a try but at Sniffa, I swooned over Atelier Cologne Blanche Immortelle. Uh-oh! Tom Ford is starting to churn ’em out! That’s a good and bad thing! Good because people, me included, are always ready for the next thing even if we haven’t made a dent in the first one. When someone comes out with a fragrance I’m ready for the next from the designer/celeb in two months! The bad about that is sometimes the quality suffers. They get rid of the great (Amber Absolute) to add the bull (Sahara Noir). Anyways, I’m dying to try the Costa Azzurra. I’ve still seen it for 300£ on a couple sites… Google it…. Interesting though…and IMHO, they ought to be cheaper! Oh, they won’t be…. Tom Ford NEVER is! I do have a sneaking suspicion I’m gonna love these two new ones… I’m already in love with the bottles….. As a heterosexual man, I can say this with FULL ASSURANCE: Gay men rock on several fronts……. I like the Costa Azzura. It reminds me of Creed’s Aventis. I have the Neroli Portofino and think the Costa should layer well with the Neroli.